Recently Hydrex carried out six stern tube seal operations all across Europe in a very short time span. Here is a review of two of the repairs: In Flushing the four damaged seals of a 268-meter container vessel were replaced underwater with our flexible mobdock technique. In Antwerp a seal operation was performed on a trimmed 185-meter general cargo ship. Both repairs were carried out in cooperation with the OEM. Because the container vessel had a very tight schedule, Hydrex proposed to carry out preparatory work during an earlier stop in Dunkirk. This included the removal of the rope guard. As a result the divers could immediately start the operation when the ship arrived in Flushing. They installed the flexible mobdock to allow for work in dry conditions. 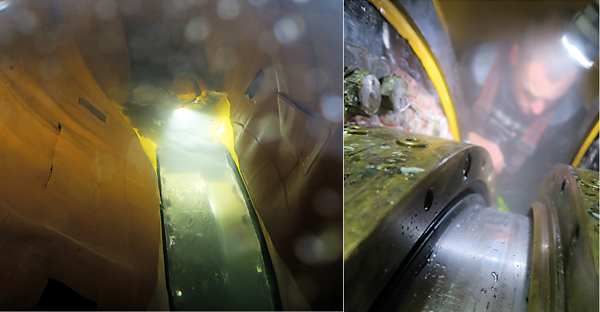 During the operation the divers removed the four damaged seals and replaced them with new ones. Working together with the OEM allowed them to provide the customer with original spare parts which guarantees the best quality material. A technician of the seal manufacturer was also present during the operation. Taking advantage of the flexible mobdock technique the team was able to carry out the entire repair on-site and underwater. Because all the required material is ready to be transported at all times, no time was lost making preparations. The ship then sailed to her next destination without delay to the schedule. During her stop in Le Havre the team reinstalled the rope guard and finalized the repair. By organizing all steps of this operation from start to finish the owner did not have to worry about making any arrangements for the repair. Mobilization to this operation was done using one of the workboats loaded with all the needed materials. These boats are fully equipped as dive support stations and can be used for a wide range of operations. They increase flexibility of operation, which is essential during operations like these where speed is of the utmost importance. The general cargo ship also suffered a leaking stern tube assembly. The owner contacted Hydrex and asked us to find the best possible afloat repair solution. Because the vessel could be trimmed Hydrex suggested to replace the damaged seals above water during the ship’s stop in Ghent. The repair would be done in close cooperation with the OEM. Prior to the operation the vessel was trimmed to lift the working area above the water. The team then built a scaffolding around the stern tube seal assembly. Next the technicians removed the rope guard. This allowed them to clean the entire area and perform an inspection. The assembly was then opened to give the service engineer of the OEM access to the seals. After the seals had been replaced the assembly was closed again. Leakage tests were then successfully carried out. The team repositioned and secured the rope guard. They removed the scaffolding to conclude the operation.